We're always looking for a quick and tasty improvement on the everyday chicken dinner — we all know how easy it is to get stuck in that poultry rut. 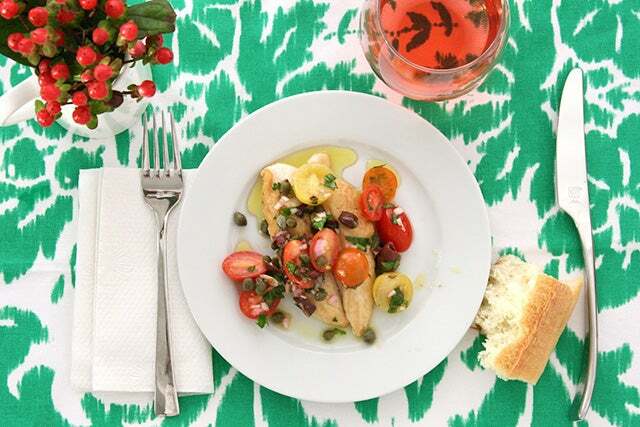 And, that’s exactly why we’re excited for this super-savory recipe, which jazzes up a simply prepared chicken cutlet with a delicious tomato-caper dressing. Photo: Courtesy of Erin Phraner. Mix up the tomato-caper dressing when you have a free minute, then store it in an airtight container in the refrigerator for up to one week. We spooned it over chicken tenders, which we lightly dusted with flour before pan cooking for a little crust. But, feel free to get creative! This simple condiment (grape tomatoes, capers, shallot, olives, and parsley) is also tasty over steak, pork chops, salmon, and even scrambled eggs.